The goal of the indie games for libraries project, housed at the Technoculture Art and Games (TAG) Research Center at Concordia University and made possible by a grant from the Knight Foundation, is to make independent digital (video) games available to patrons of library systems by fostering legal as well as technological relationships between libraries and independent video game developers. 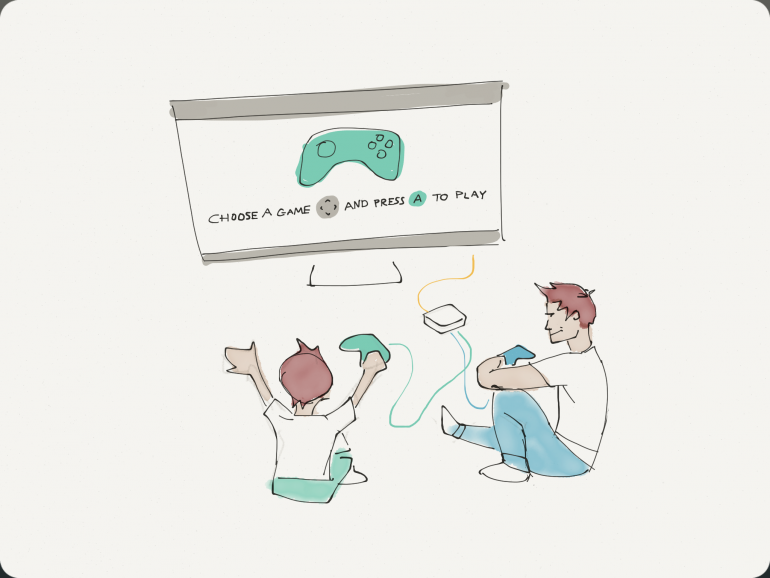 Our mission is to devise and build a video game console preloaded with independent games and available for patrons at libraries. Figures 1 to 6 (below) provide some visuals concerning our project. In addition, a presentation of 49 slides is also available online, showing additional visuals of our project timeline. Please note that this document is available online via the TAG blog so it can be shared and commented by others. 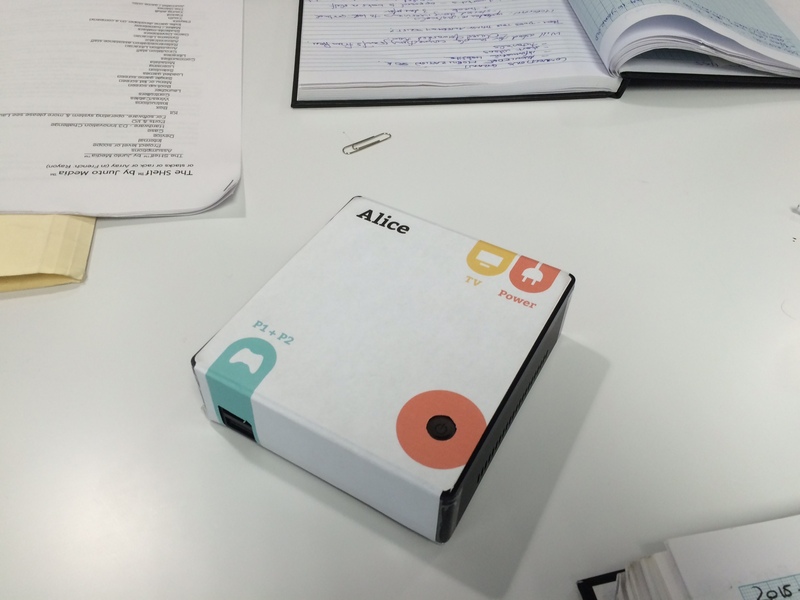 Prototype codename “Alice” of the “kit” with console, wires and controllers. 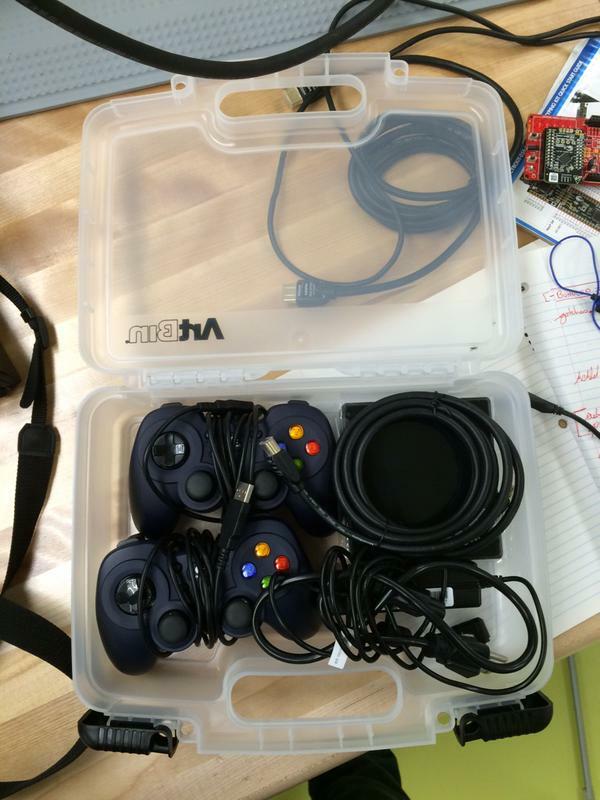 Developed a technological solution using open source software (Linux and the Kodi media player) on an inexpensive generic mini-personal computer (Gygabyte Brix) to run 5 games. As of the summer of 2015, the Kit shown in Figure 1, codenamed “Alice” costs less than 350$USD in parts. In addition to the resources required to program and test a custom software environment, we learned that certifying games to run on our (or any) platform is a labor-intensive process. Met independent game developers in Montreal and Austin (TX) to discuss ways to include their games in libraries. We learned that the business model of major players (Sony, Microsoft) is out of the reach of most library systems. In addition, we learned that the window during which an indie games is profitable is rather short (stemming 3 to 6 months) and some indie developers have indicated that they would consider alternative licensing or pricing solutions as long as they are simple and flexible (similar models already exist, such as the Humble Bundle where a player names their price to receive access to a list of games). A few indie developers adhere wholeheartedly with the library mission and showed a keen interest in providing their games to libraries as a symbolic gesture. Observed game clubs in libraries and discussed game-related issues with library professionals. We learned that games are very popular and offer ways to engage library communities with their local institution, attracting patrons and driving demand for all services. We also learned that there is a dire need to train library staff about games and offer simple programming opportunities to make better use of existing library game collections and other resources, such as television screens mounted in the library; teen-rooms; publicly accessible computer equipment; etc. The evidence gathered during our first phase suggests very positive support for our idea from the developer as well as the library communities. Although we want to further test these assumptions at a wider scale with the various funding avenues mentioned above, so far, it seems our project addresses specific market failures: the need for visibility of independent games; the professional role of library staff in curating a culturally meaningful local collection; and the risk-free consumptive role of patrons exploring cultural products via libraries. It also provides for a technological program at low cost to libraries. In fact, we are trying to find a middle ground where traditional library missions and roles meet the needs of independent game developers. Building an analogy for the discoverability of digital games in a library: Because of the inherent commercial nature of accessing digital games, most existing online game systems (Sony’s PlayStation Network, Microsoft’s XBox Live, Valve’s Steam) are organized around the marketplace analogy. The goal is to facilitate the purchase of games. Libraries on the other hand aim to foster discoverability through other contexts, such as serendipity or inclusiveness. On April 22nd 2015, our team held a co-design session around the issue of discoverability of digital games within the library context at the Goethe Institut, the German cultural center in Montréal. 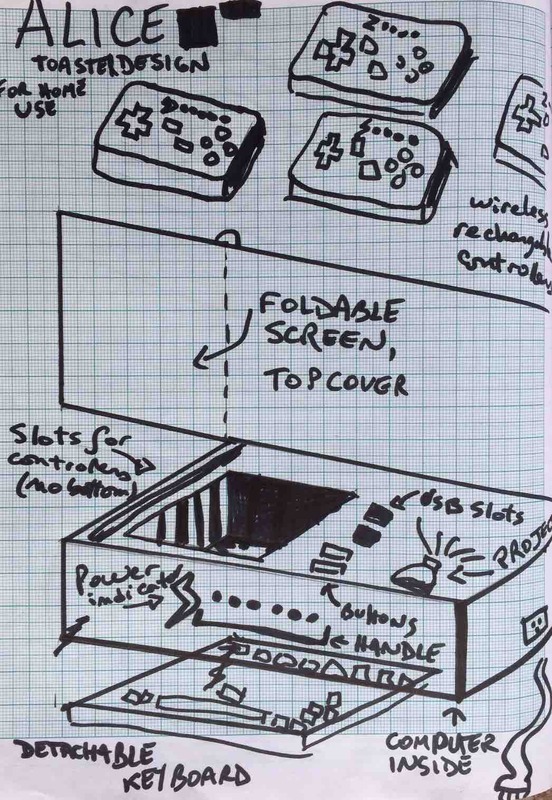 Our current approach of building a stand-alone gaming system or kit (i.e. with no Internet access) limits the possibilities to leverage existing digital discoverability tools. We discussed a variety of examples, including tying game descriptions to subject headings so that playing a game informs the use of other library collections. The possibility of connecting many Alices together or connecting them to the Internet raises some rather interesting questions, but highlights limitations to our current approach. Operating system and hardware choice: After a thorough analysis of hardware and software options and costs, our team settled on using a stripped-down version of the Linux open source operating system, running Kodi, a media management software. Using Windows would have required selecting more robust hardware, which would have driven up our costs. In addition, Windows did not offer as many engineering options to craft a unique user experience. In that sense, we could not port the Arcade Royal system (as was in our grant agreement) because it is based on Windows. In addition, this software choice limited the number of games we could select, as a game needed to be ported to Linux for it to run. We also discovered that stripping down Linux to run on a micro-PC caused some games to behave erratically as indie game developers have coded their games with the expectations of a full operating system. Certification and the context of indie games: in addition to the difficulty posed by the operating system and hardware choice discussed above, we discovered that many indie games assume that their game will have full Internet access, may not offer language options, have limited settings, or require specific file structures which may not all be supported by our Linux-Kodi system. In that sense, certifying games to run on our system became a much more arduous task, as selecting a game meant much more than simply launching a program. We had to ensure that all levels played correctly and test all settings and features. Arguably, the certification issue would present itself independently of the operating system choice (that is to say that we would have faced it with Windows too). Certifying some games may require us to have indie game studios perform additional work to tweak their games to run on Alice. Streaming as an alternative access strategy: The choice of testing standalone kits in libraries stems from the idea of leveraging existing assets of libraries, namely physical space and staff. Truth be told, the technology already exists for existing commercial providers to offer streaming solutions to libraries. Some library professionals have anecdotally indicated that this may be preferable, particular for an academic setting (University and colleges offering a game-based curriculum are looking to build game collections). We feel that streaming would limit the impact of leveraging cultural programing, curation and existing library assets in the short term. That said, the question of streaming will come soon enough. 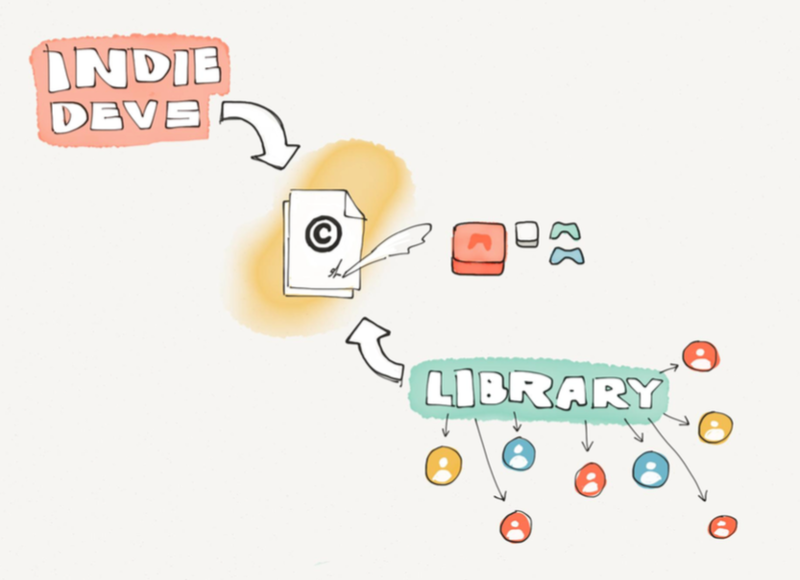 Building the right kind of copyright framework for indie developers and libraries: Our initial approach was to address the question of access to games in libraries from a formal licensing perspective. This lead to some interesting conversations with independent developers. Some quoted licensing fees beyond the ballpark reach of most library system, when compared to, say, other digital licensing solutions for ebooks. Others voiced concerned about how such a formal licensing scheme would mesh or interfere with existing commercial licensing agreements they have with current partners. 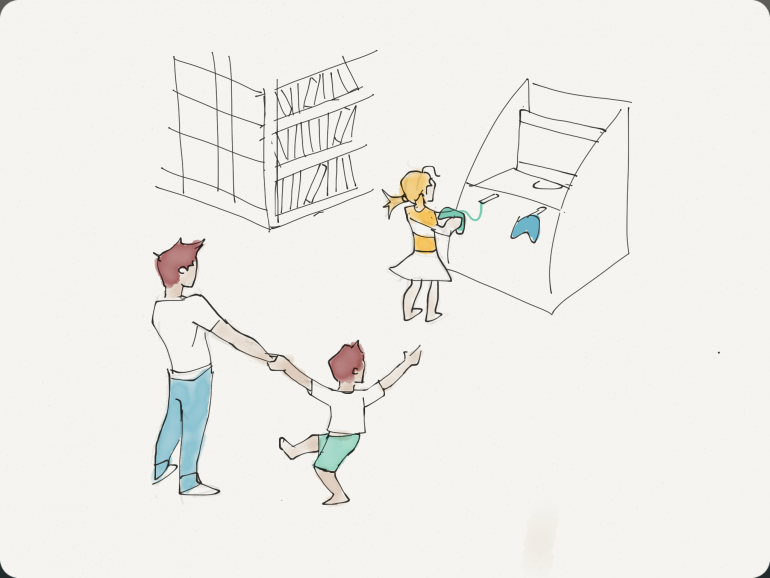 Sensing apprehensions of a “hard law” approach through formal licensing, we pivoted to another possibility: that of exploring the accessibility of games in libraries as a beneficial outcome to independent developers based on the social mission of libraries. This would involve a “soft law” approach, such as the “Shared Electronic Resource Understanding” from the National Information Standards Organisation (SERU from NISO). A soft law approach would entail formulating best practices or shared understanding based on mutual trust, respect and communication. These are rooted in law, but act according to values rather than contractual obligations. It is an emerging approach to contractual relationships of digital content. In fact, they could stem from the age old requirements for legal or copyright deposit of books to national libraries as well as the public lending rights system for books in certain countries. More analysis of these questions are required but it would seem that the soft law approach shows much promise. In-library or home use: our initial assumption was that Alice would be available to be borrowed by patron for home use. It became apparent that Libraries organize game clubs and other game-related activities. Although in-home use is still relevant, we are pivoting to focus on in-library use. This will not only simplify testing procedures but, minimize the impact of the project on regular library operations. 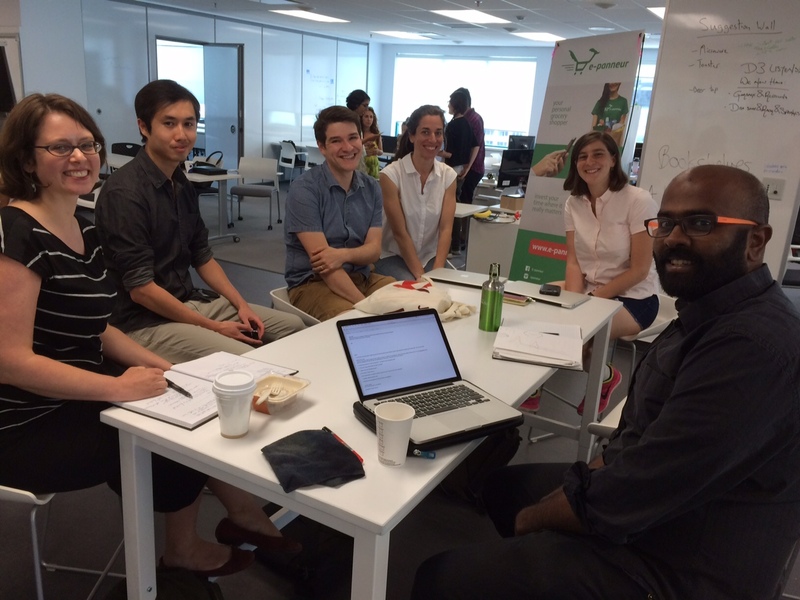 Project team assembled on July 7th 2015. From left to right: Felicity Taylor (PhD Candidate in Fine Arts), Brian Li (designer), Will Robinson (PhD student in Game Studies), Kathryn Jezer-Morton (MA student & ethnographer), Sydney Warshaw (law student), Prem Sooriyakumar (Knowledge Broker, Concordia University). Photo by Olivier Charbonneau, project leader and Associate Librarian, Concordia University. We are targeting the Social Science & Humanities Research Council of Canada “Connexion” and “Insight” grants. Depending on various factors, Olivier Charbonneau or Bart Simon, both from Concordia University, may be the Principal Investigator for these requests. In addition, the Goethe Institut has indicated strong support in exploring our system within the context of their worldwide network of German cultural centers. Finally, we are preparing a proposal to the Knight Foundation for further funding. The above rough drawing illustrates some changes we would like to bring to Alice, based on lessons learned following the development of our initial prototype.